All presentations from the successful MOOQ Conference 2018 are online now! 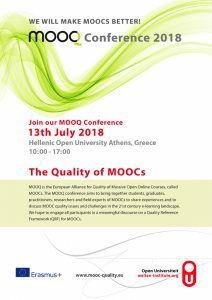 Our European initative MOOQ could welcome around 100 participants joining the exciting and interactive event: The theme “The Quality of Massive Open Online Courses (MOOCs)” was attracting them to join us in Athens on 13th of July 2018. The MOOQ Conference was a huge success! “The Quality of Massive Open Online Courses (MOOCs)” was the hot topic on 13th of July 2018. The European initative MOOQ had invited and around 100 participants joined for an exciting and interactive event. 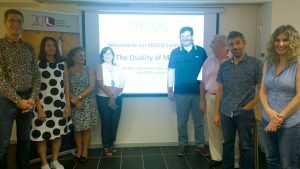 The state-of-the-art and latest research result from MOOQ were presented at the headquarters of the Hellenic Open University in Athens. MOOQ presented the latest publication with the findings from the Global MOOC Quality Survey (GMQS) at the 18th IEEE International Conference on Advanced Learning Technologies (ICALT) in Mumbai, India. 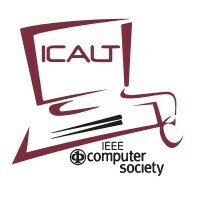 The full paper is published in the ICALT 2018 proceedings on the very prominent and first position (on pages 1 to 5), a copy of the pre-final paper is available in our scientific publications here. The presentation was gaining huge interest and causing a lot of questions: The slides are now avaialable here. All MOOQ partners have met for the final consortium meeting in Athens. 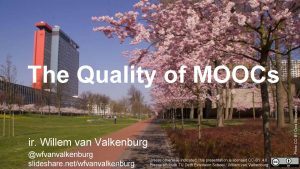 On 12th of July 2018 they have finalized the preparations of the European Conference on “The Quality of MOOCs” that took place on the following day. The final version of the Quality Reference Framework (QRF) is the most important results from the MOOQ project. All partners agreed that a new version will be prepared on the basis of the feedback from the conference participants and their lively review and discussion of the QRF in the interactive workshop sessions. A final version of the QRF will also be improved with a new design and catching icons. In addition, the the Global MOOC Quality Survey (GMQS) with the three surveys for MOOC learners, designers and facilitators has delivered very interesting insights how to improve the design of future MOOCs. The first findings are already published, more publications will follow soon. 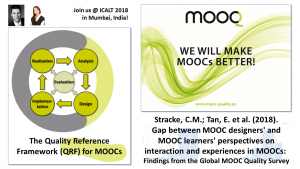 MOOQ presents the findings from the Global MOOC Quality Survey (GMQS) at the 18th IEEE International Conference on Advanced Learning Technologies (ICALT) in Mumbai, India. The full paper submission was accepted by the international evaluators in double-blind peer review: It will be presented on Tuesday, 10th of July 2018, at 14:00. Conference venue is the prestigous Indian Institute of Technology (IIT) Bombay. MOOQ is pleased to present first findings from the Global MOOC Quality Survey at the Festival of Learning 2018 in London! The MOOQ paper by Christian M. Stracke and Esther Tan was accepted by the world-renowned and high-ranked 13th International Conference of the Learning Sciences (ICLS) organized from the International Society of Learning Sciences. The online discussion on “How to ensure Quality in Open Education” is taking place on 27th of October 2017 from 12pm to 1pm CEST. It will be moderated by Christian M. Stracke as the coordinator of the European initiative MOOQ for the Quality of Open Education and facilitated by the European platform Open Education Europe (OEE) from the European Union. All experts and practitioners worldwide are kindly invited to join and to exchange their opinions and experiences! The second international World OER Congress 2017 led to the approval of the Ljubljana OER Action Plan and a revival of the quality debate. Experts and national delegates from 111 countries adopted the 41 recommended actions by acclamation. All United Nations’ Member States are urged to mainstream open-licensed resources building knowledge societies and to achieve the 2030 UN Sustainable Development Goal 4 on Quality Education. 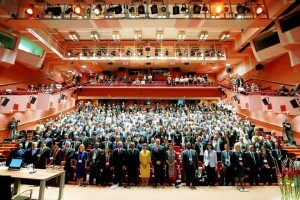 A plenary panel of the UNESCO and ICDE Chairs in OER was emphasizing the need to take on the momentum. 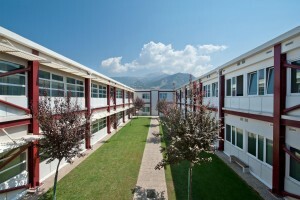 “We were pleased and excited to follow up the quality focus in Open Education with online discussions and a dedicated MOOC”, beams Christian M. Stracke, ICDE Chair in OER from the Welten Institute of the Open University of the Netherlands.